I came here with a feature request. The basic idea is to enhance regions behavior with sets, with sets (groups), which can be displayed, hidden, and named. I use regions a lot. But not for the same things. Sometimes I have several kinds of regions, that overlap each over. It would be nice if we could define a set (ID with name) of regions, and have the ability to choose what set to display. For example, subtitles would be regions set #1, scenes would be regions set #2, and with two clicks on the region manager window I choose to hide regions 1 and display region #3 scene. The region set ID number and name could be set via the region manager window, the region property windows and the add regions window. Several regions could be put in a set at the same time. Regions set could have names. We could choose what set of region to export. Region numbering could be group dependent (This way, we could have several set of regions (for examples Acts, Scene, Chapters...) all starting from the number 1). This would allow to have several set of regions one project, which would be very useful especially if some of these regions are subtitles (regions export doesn't keep regions subtitles, and subtitles export doesn't keep regions name). 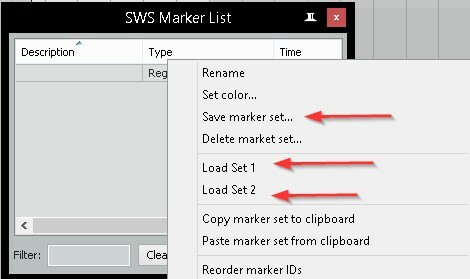 We have the ability to export regions list but it doesn't allow quick switch between different sets of regions. One "set" only is saved in the project. Can I open a Feature Request for this ? Best Workarround, this very nice script by Heda ! Last edited by X-Raym; 03-26-2018 at 08:10 AM. It just just "SET 1" and there is just the set 1 anymore, my other regions are gone. I need something more flexible, which allows to display several sets at once if needed A bit like the track manager but for regions. Actually, there isn't any way to temporary toggle hide/set regions. It just reload a new set, and delete all regions was not saved into one set. Ah ok, I see now. True, that flexibility isn't offered yet. Thank you for you interest in this ! I was thinking was regions group would be even nicer if the regions numbering was group dependent. This way, we could have several set of regions (for examples Acts, Scene, Chapters...) all starting from the number 1.
heda as build a script that could be an answer to this need, using empty items and tracks to define regions and groups. +1!! Please Cockos, make this feature native! It would also be useful if the region number had an option to be made invisible. I use regions to indicate chords and I don't want to see a number before the chord name. Check heda's script linked above. very nice workarround. It can solve this FR. That script is useful, but I don't actually use it. Compared to a proper built-in feature it is not as well-integrated as I'd like it to be. It's a brilliant script, but it's not the same as a more robust region system. Generally, I'd like regions to behave more like items in a track. It is EXACTLY what heda's script allows ! ^^ Note that it is now in v2 with more advanced features for RRM compatibility etc. Heda's script is a workaround. It's a brilliant script, but it's not the same as having a region system that is integrated like items. I tried using it, and it didn't fit into my workflow the way I thought it would. Reaper just needs more native, robust, and built-in features for regions. We're all in agreement there. HEDAs script is great and very impressive, but i could use native integration that does not require naming tracks to function.